Migraines are an especially devastating kind of headache. Migraine attacks often involve a prelude neurological symptom termed "aura". It's a neurological anomaly that may render one confused, dizzy, extremely sensitive to bright light, experience unusual bodily sensations, distorted vision, and visual and auditory hallucinations. Some say it may mimic a bad LSD experience. Migraine attacks are not just bad headaches. It is a harmonic or shadow of seizures and strokes. Stress: This includes anxiety, worry, and shock. Ironically, a sudden relief from stressful conditions can be a trigger as well. Finding ways to consistently relieve your stress, and being consistent with this can reduce or eliminate migraine attacks. Some good stress relievers include meditation, exercise, and EFT. Many people swear by a good hot bath, throw in some Epsom salts for an added benefit. Hormones, especially around Menstruation can be a trigger. So can birth control pills or patches. Although the natural hormone fluctuations cannot be avoided, artificial ones can be. This can include avoiding plastics as well as estrogenic foods such as soy products. Alcohol and excessive caffeine consumption are common triggers. Suddenly quitting coffee is another potential trigger. Foods: Anything containing MSG or aspartame can be a trigger. After all, they are brain cell excitotoxins that should be avoided by everyone. Processed meats with nitrates, marinated or fermented foods such as pickles are another. Unfortunately, ripened cheeses such as brie and cheddar, and worse yet, chocolate, may be triggers. Excessive citrus is another potential trigger for migraines. Even sourdough bread, especially if freshly baked, could be a trigger. There are other foods that are less common, so a good food/headache diary would be indispensable. Strong odors can be common triggers. This can even be the perfume someone is wearing as you walk by them in the store, at work or in any group setting. At home 'air fresheners' are common triggers as these are really perfumes in disguise. Flickering lights are a common trigger. 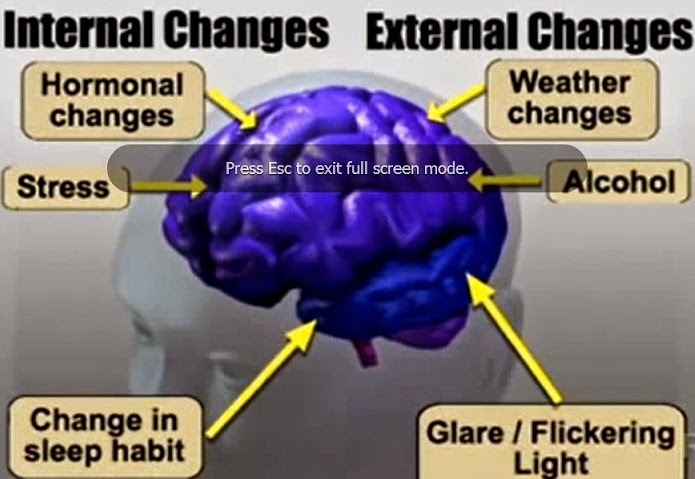 This can be as simple as sunlight filtering through trees or buildings as you drive past to movies or video games that constantly change light intensity. Strobe lights are a very common trigger. Nutritional deficiencies are also common triggers. These can include magnesium, calcium, Omega 3 fatty acids, and Vitamin E.
Dehydration is a very common trigger of migraines. Instead of looking at the average 8-10 glasses and wondering if that is a 4 ounce or a 32 ounce glass look at your water intake in ounces. Divide your body weight (in pounds) in half. This is the number of ounces you need each day. Try to get half of them before lunch. Whenever you are sweating heavily you will need even more. If after taking into account all of these you are still getting migraines don't give up hope. There are some natural ways to get rid of the pain and discomfort quickly. Melatonin: This is probably the least convenient remedy as it is time of day specific. The common recommendation is 3mg at bedtime. It can be combined with butterbur for even better results. Feverfew is another herb that relieves migraines. It is not recommended during pregnancy. Magnesium reduces the stress and muscle spasms that can trigger migraines. It can be found in the herb Purslane as well as in topical supplements and Epsom salts. If taking an oral supplement be cautious as it can cause cramping and diarrhea. Valerian root can help you relax and sleep, which speeds recovery from a migraine. Peppermint can be used as a food, a tea, or in essential oil form. Rub the essential oil on your temples for relief. It can be combined with lavender, rosemary and eucalyptus for even more relief. What about my dental health?